GET THE BEST TASTING WATER NOW Berkey Water Filter Systems provide the cleanest, best tasting water quicker than refrigerator pitcher filters & better tasting than bottled water & refrigerator filters Berkey Stainless Steel water filters work with no electricity, only gravity is needed. 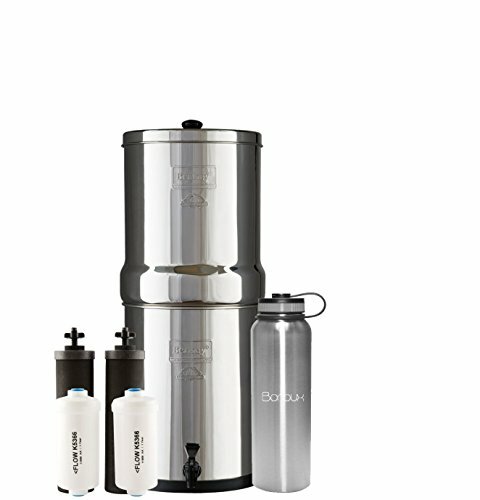 Each Berkey water filter system comes with 2 black Berkey filters & 2 Fluoride Filters, and is easy to setup and easy to use. Use tap water, well water, refrigerator water, rainwater, even river and lake water! If you have any questions about this product by Boroux, contact us by completing and submitting the form below. If you are looking for a specif part number, please include it with your message.